Considering its origins, few concepts in the history of comics have defied the odds quite so much as the Suicide Squad. The nature of comics is such that every corner of comic book history is littered with failed concepts. 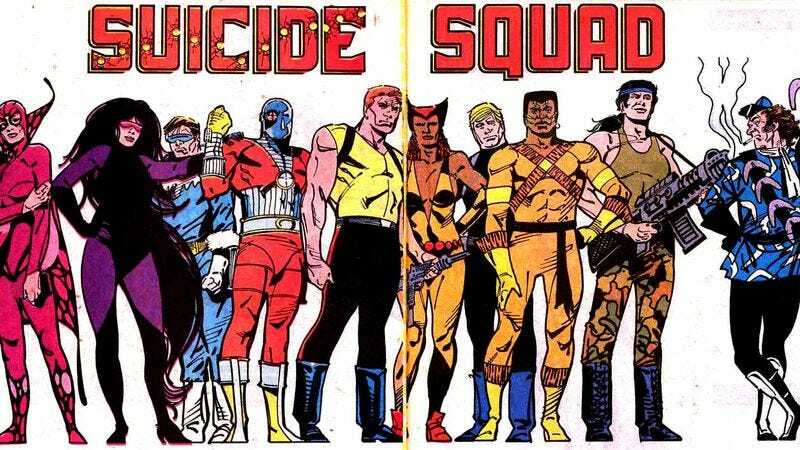 The Suicide Squad was for the longest time just such a failure: After a handful of appearances in the late 1950s, the Squad disappeared from stands for a full 26 years. When they reappeared in 1987 the idea had been—despite a few nods to the original run—completely retooled and updated for the Reagan era. It’s this version of the Squad that has stuck around, despite a number of cosmetic changes. The Suicide Squad is important because it was one of the very first successful attempts in comics history at creating a villain-centered book. While characters like the Joker and Dr. Doom had held down solo titles for brief periods in the past (or, in Doom’s case, Super-Villain Team-Up, which he shared with a rotating cast of ne’er-do-wells), the idea of a book populated almost entirely by supervillains was an idea that had never really found a hook on which to hang. DC’s own Secret Society Of Super-Villains managed 15 issues in the late 70s, while Super-Villain Team-Up lasted 17. It’s not difficult to see why: Villains, by their very nature, have to lose. How do you build a book around characters who can never win? The answer was simple: give them something to do besides being villains. The first incarnation of the Suicide Squad, however, had nothing to do with villainy. It was the product of a transitional period in American comics, at the tail end of the superhero drought of the late ’40s and ’50s but still not quite to the point where the stands were once again flooded with long-underwear characters. Adventure books had never really gone out of style, but the mood of the times favored increasingly flamboyant costumes and locations. Into this environment, DC launched the Suicide Squad. It’s worth mentioning that while the name “suicide squad” carries particularly macabre associations now, it doesn’t appear to have been upsetting in 1959. That’s the year that DC shipped issue #25 of The Brave And The Bold, featuring the debut of the Suicide Squad, “The Three Waves Of Doom!” created by Robert Kanigher and Ross Andru. The original version of the squad, also known as the mysterious “Task Force X,” had little to do with superheroics. Instead the Squad was a military team, four people brought together with similar backgrounds in personal tragedy to face impossible odds, literal “suicide missions,” a phrase that would have been more familiar to a generation raised on WWII stories. Kanigher was responsible for much of DC’s well-remembered war comics line from the 1950s and 60s, both as an editor and as a writer. He is also credited with creating, alongside Carmine Infantino, the Barry Allen Flash when the character was revived in 1956, as well as the enduring soldier Sgt. Rock, with Joe Kubert. This scene must have been cut from the movie. Cover by Andru and Esposito. With that in mind, it’s best to approach the earlier Squad stories as cut from the same cloth as Kanigher’s other military books, particularly sci-fi and fantasy-tinged series such as “The Haunted Tank” and “The War That Time Forgot.” The four members of the first Squad all shared a reckless attitude toward danger inspired by formative tragedies. The Squad’s leader, Col. Rick Flag, was the last survivor of his WWII flying squadron; army nurse Karin Grace was the last survivor of a crashed ambulance plane in the South Pacific; and the final two members, Hugh Evans and Jess Bright, were both nuclear scientists who had almost died during a bomb test in the final days of the war. All four shared the experience of being the last survivor of a wartime calamity, and by coincidence they all received the strange admonition from their dead compatriots to “carry on for us.” The four shell-shocked members of the Suicide Squad threw themselves into the jaws of death time and time again, fighting mythological Cyclops and throwing giant horned dinosaurs into the sun. In one adventure, they were accidentally shrunk down to the size of ants and had to fight a seagull. The problem with the original Suicide Squad is that the book just wasn’t very interesting. The series read strikingly similar to another of DC’s recent successes, Jack Kirby’s Challengers Of The Unknown, which premiered at the tail end of 1956. The Challengers’ gimmick is that they were four men (and later one woman) who had all survived near-death experiences and concluded they were living on “borrowed time.” They banded together for the purpose of, well, challenging the unknown in as reckless a manner as possible. The Challengers soon graduated from the anthology Showcase and into their own book, which ran a healthy 77 issues. Task Force X, however, never made it past a handful of appearances in The Brave And The Bold. They shuffled off to limbo, where they would remain for 27 years. In 1987 DC was on something of a roll. After the conclusion of its massive, mega-selling Crisis On Infinite Earths maxi-series, the company found itself in need of a follow-up. But how to follow up a series so significant and far-reaching that it featured literally every character the company had published in 50 years? The solution was simple: dial back on the cosmic shenanigans in favor of a (slightly) smaller scale, and dedicate the story not to destruction but to creation. Whereas Crisis featured dozens of characters’ deaths and the destruction of an infinite number of parallel universes, Legends focused on rebuilding a few things that had been smashed along the way. Alongside a new Justice League and the debut of George Pérez’s Wonder Woman reboot, it also featured the first appearance of the all-new, all-different Suicide Squad. The man responsible for the success of the Suicide Squad as both a book and a concept is John Ostrander. After spending the early ’80s working primarily on his own characters (such as the futuristic mercenary Grimjack), Ostrander made the move to DC in 1987. Alongside Len Wein and John Byrne, he plotted the modern Squad’s first appearance in Legends, which included the first look at the character who would go on to define the team in all its further appearances: Amanda Waller. It would be difficult in hindsight to overstate just how radical a concept Waller was when she first appeared. After years of government bureaucrats being portrayed as, at best, feckless, or worse, downright sinister, here was a career civil servant who not only fought on the side of the angels (sort of, most of the time), but was brutally effective in doing so. A single mom who lost part of her family to violence growing up in Chicago’s Cabrini-Green housing projects, she quickly rose to prominence in Washington as a congressional aide with a reputation for efficiency and bluntness. It was these talents that put her in a position to pitch President Reagan on a revamped and streamlined Task Force X. The concept behind the new Suicide Squad was simple: take some of the super-criminals and psychotics clogging up prison cells in the DC Universe, and give them the opportunity to work off their sentences doing jobs for Uncle Sam. Only, they wouldn’t be picking up trash off the side of the road—they’d be undertaking the most dangerous black-ops missions. The cover of the first issue spelled out the premise precisely: “These eight people will put their lives on the line for our country. One of them won’t be coming home!” Here was a comic that didn’t just tease cheap character deaths, it promised carnage on the cover of the very first issue. It is hard to imagine a timelier concept in 1987. In the wake of the Iran-Contra scandal and growing awareness of the United States’ long history of waging covert war in distant parts of the globe, the idea that the government might employ super-criminals for the purpose of circumventing legal niceties to broadcast American power seemed inevitable. Ostrander’s Suicide Squad—ably embellished by series artist Luke McDonnell—fit snugly into the pantheon of ’80s pop-culture political artifacts, alongside Cannon Films’ library of low-budget political action thrillers, Tom Clancy novels, and G.I. Joe. In particular, Ostrander borrowed liberally, at least in terms of tone and theme, from Larry Hama’s formidable run on Marvel’s G.I. Joe. Although often overlooked now as “just” a toy comics, Hama’s Joe was one of the more interesting—and best-selling—comics of its era. A war comic wrapped in a toy commercial, Hama (who had a hand in developing most of the major characters and concepts from the early days of the franchise) established the G.I. Joe universe as one where war was a regrettable part of life often fought by good men for the wrong reasons. As opposed to much of the jingoistic pop culture of the period, G.I. Joe approached the politics of the late Cold War era with a heavy dose of liberal cynicism stemming from the left’s consensus that the Vietnam war had been fought under false pretenses and that American soldiers had been betrayed by their own government. Hama, who served in Vietnam, replayed this drama time and time again in the pages of G.I. Joe, where his supposedly one-dimensional toy characters were repeatedly betrayed by an inconsistent U.S. government that saw war not as a tragedy to be avoided at all costs, but just another weapon in the diplomatic arsenal of American foreign policy. In this context Ostrander’s take on the Suicide Squad is the obvious step from Hama’s world-weary and surprisingly balanced view of American military might. The Suicide Squad was a terrible idea from every perspective other than the desire to secretly enforce American policy goals across the globe. A team full of super-criminals would be an unstable mixture under the best of circumstances. In order to control the team Waller slapped each member with exploding bracelets that triggered at her command. It wasn’t a bluff, either: On an early mission Z-list supervillain Slipknot called Waller’s bluff and almost bled to death in the middle of a swamp after getting his left hand blown off. The “heart” of the Squad, if such a nasty group can be said to have a heart, was the foursome of Waller, Deadshot, Captain Boomerang, and Bronze Tiger. Deadshot was an obscure Batman villain who had appeared once in 1950 before being revamped in the late ’70s by Steve Englehart and Marshall Rogers during their highly regarded run on Detective Comics. A nihilist by nature, Deadshot remained a (more or less) dependable constant in Waller’s Squad. Captain Boomerang (created by John Broome and Carmine Infantino in 1960) was the opposite of dependable, a constant thorn in Waller’s side who, despite his flippant attitude, was a formidable opponent who earned his stripes fighting the Flash. Bronze Tiger was an obscure martial arts character created by Dennis O’Neil, Jim Berry, and Leo Duranona for the short-lived Richard Dragon, Kung Fu Fighter in 1975. Bronze Tiger was not a criminal, but rather a civilian brought on by Waller to ride herd on the team while recovering from traumatic brainwashing. His spiritual journey formed one of the book’s longest-running plotlines. The fun of a book like Suicide Squad was seeing all the ways a knowledgeable creator like Ostrander could incorporate so many disparate elements of DC history into a surprisingly tight and consistent narrative. Obscure Batman villains rubbed shoulders with characters from Jack Kirby’s Fourth World saga, while random figures from the mid-’70s martial arts fad went toe-to-toe with the some of the Flash’s most colorful villains. Even a pair of Batman’s most notorious foes, the Penguin and Poison Ivy, ended up serving brief tenures on the Squad. Later in the run, Ostrander worked with writer Kim Yale (who also happened to be his wife) in rehabilitating Barbara Gordon after being crippled by the Joker in the pages of The Killing Joke. Disgusted by the character’s treatment, they brought her into the book and established her new heroic identity as Oracle. The one constant throughout the book’s five-and-a-half-year run was Waller. Powerful without actually having any powers, able to stare down Batman without betraying an ounce of hesitation or fear, Waller was unique. Although she was ruthless about achieving her goals—and the goals of the United States, although the two didn’t always mesh perfectly—she also knew full well just how much her activities with the Squad threatened the ideals of the country she had sworn to protect. Time and again throughout the series’ run she is forced to confront the consequences of her actions, stripped of control of the Squad, and even put on trial for her misconduct. She was also a middle-aged black woman, short and overweight, in a medium where these traits are rarely celebrated. Whenever Waller has appeared in live action, however—she has appeared on Smallville, Arrow, and the ill-fated Green Lantern film, in addition to the imminent Suicide Squad—she has invariably been portrayed by thin actors. This was formalized in the comics when her appearance was officially revamped at the outset of DC’s New 52 promotion. She’s now commonly portrayed as a physically fit younger woman, but it was revealed at the San Diego Comic-Con that beginning with August’s Suicide Squad: Rebirth Amanda Waller will be returning to her old look. Yay! The first volume of Suicide Squad ended in 1992. Task Force X was disbanded, Waller retired from her black ops work, and the concept put to bed for a time. The team continued to appear across the line, however, reflecting the affection with which the characters and concepts were regarded in the wake of Ostrander’s run. A relaunch in 2001 shared little with Ostrander’s book except the name. Ostrander himself returned to the characters, first in 2008 for a limited series and then in 2010 as part of the line-wide Blackest Night crossover, which featured the gimmick of dead (canceled) books being resurrected for one month as part of the death-themed storyline. In 2011 the Squad returned to the realm of monthly comics, without Ostrander, as part of the aforementioned New 52. Gone was the intricate plotting and careful moral calculus that defined Ostrander’s incarnation, replaced by often sensationalistic violence. Although Waller was still the team leader, with Deadshot at her side, the book was now dominated by the likes of Harley Quinn and the man-eating King Shark. It was not regarded as one of the New 52’s critical highlights, save for a brief four-issue run by Ales Kot in 2013 that pulled as much from the works of Michel Foucault as John Ostrander. Unfortunately, this promising new direction was cut short by various factors which led to Kot’s departure from the company. There’s no real reason, in hindsight, why the Suicide Squad should have had such a lasting imprint in popular culture when similarly obscure concepts like the Challengers Of The Unknown, the Sea Devils, and the Blackhawks have mostly faded into the background noise of the DC Universe. Old ideas in comics are rarely forgotten, and it’s the nature of the industry that dead concepts are constantly being recycled in the attempt to spin gold out of past chaff. Most of the times these attempts at copyright renewal leave little impact, but Ostrander’s run on Suicide Squad casts a long shadow. Although the tone of the new film bears little resemblance to Ostrander’s revamp, the skeleton outline of his version are still visible. It has proven a remarkably durable concept that has survived multiple failures and copycats. Not bad for a series that was first put out to pasture during the Kennedy administration.